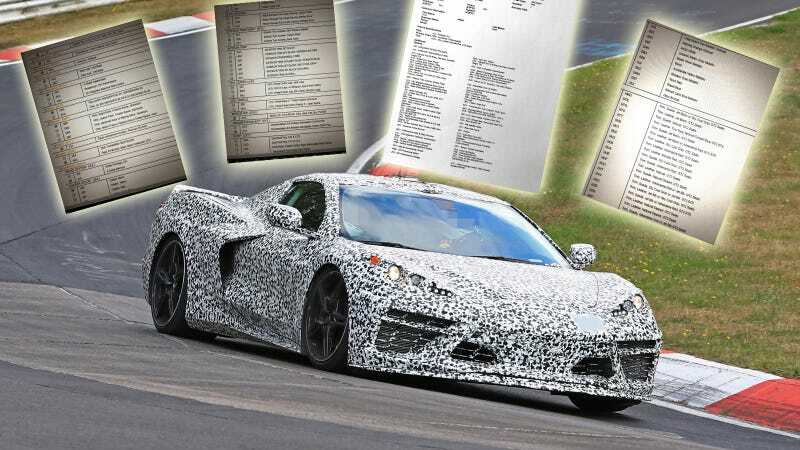 Though it’s apparently suffering from some development delays, details about the mid-engine 2020 Chevrolet Corvette are staring to trickle out at a faster pace. Now, an anonymous tipster has clued us in on potential technical details with screenshots of what appears to be the order guide for the model. Engine and transmission availability are listed, along with many of the other options like suspension and tire types and interior details. And while we cannot immediately guarantee their accuracy, based on other order guides and spec sheets we have seen—along with other known intel about the car—we believe they are legitimate. The first screen shot starts out with the powertrain details and shows that the sole engine option on this document is coded as LT2. The abbreviations for the engine state that it is a high output aluminum eight-cylinder engine with direct injection, variable-valve timing, and Active Fuel Management. This engine is likely a refresh of the current LT1 engine, which means that it will be the base option and should make somewhere between 460 and 500 horsepower based on the specs of the current model. This code is new as the current traditional eight-speed automatic is coded as “M5U.” The dual clutch part is not surprising but it does have one more gear than the Tremec TR-9070 transmission that was previously speculated for it. Rear axle ratios of 3.62 and 3.80 are listed, which are very different than what the C7 currently employs. The current manual cars get a 3.42 ratio while the autos see a 2.41 ratio in the Z06 and ZR1 and a 2.73 for the rest. The taller gearing is likely associated with the ratios of the DCT and a rear end with shorter gears is currently not listed since a manual gearbox option is not on the sheet. Suspension option codes appear to be passed down from the C7 with FE1 continuing to be the base suspension. The FE2 option of standard Magnetic Ride is not listed but the FE3 option of the Z51 Performance suspension and the FE4 option of Z51 with Magnetic Ride are present. The base tire option is now listed as XFN, with the fronts staying in the same 245/35ZR19 size as the C7 but the rears growing from 285 profile tire to a 305/30SR20. An optional XFQ tire set is also listed in the same size with an RF4 abbreviation, and that is likely for a different compound. Four wheels are listed, all of which are five-spoke aluminum models that are finished in bright silver, “carbon flash,” machined, and machine w/Spectra Gray. The wheel can be outfitted with either a Stingray or Corvette Jake logo center cap. A code marked AE4 (just like the one for the C7) is described as “Competition Sport Bucket” seats while a new AH2 option is also available that lists “body contoured GT2" seats. Another page shows that these GT2 seats will be available in leather or suede and in various colors for at least 17 different combinations. Now, onto the colors. There’s many on here similar to the current C7 lineup, including Torch Red and Sebring Orange Tintcoat. But there’s some new ones here too, like Rapid Blue and Zeus Bronze. The roof is available in at least four different configurations with “dual roof” listed for the first two options, visible carbon fiber listed for the third, and a transparent top for the fourth. Based on the list, it appears that there will be two separate removable roof panels. A sample order sheet was also included in the documents from the tipster and it shows that the vehicle will be a 2020 model year with a “1YC07" model code. This sample order form shows many of the same items that are listed on the order guide but adds a few more hints like the “SC7" option code will be a storage bag for the removable hard top. Other details listed on the sample order form include the drivers and passengers seats being described as being two-way or eight-way powered, and the mirrors as being heated and power folding. Electronic Limited Slip is also signified with the G96 option. More details are also seen regarding the screen and infotainment system as the UDV option lists the color cluster and driver information display as being 12-inches in size, with U2L listing a Digital Audio System and UVA showing that it will have front and rear camera. The usual OnStar descriptor is also listed along with a 14-speaker Bose Performance Series audio system. The Performance Data Recorder also appears on the list, along with a rear cross-traffic alert sensor and an “interior movement” sensor that could either be related to the anti-theft system or possibly a driver monitoring device. The Performance Traction Management system also appears to carry over as it is shown on that sample form. The remaining items on the list appear to be safety related as a vehicle inclination sensor is listed along with side blind zone alert and rear park assist. These documents appear to show that the C8 Corvette is similar in a lot of ways to the current model, with the biggest departure being the new dual clutch transmission—and of course where the engine will sit. Since the options list is fairly conservative, this is likely a planned order guide for a launch model as the Z51 package is the highest performance package that is shown. We look forward to finding out more as we get closer to the reveal of the car. Know anything else about the C8 that we should know? Tell us here.